The chocolate chip cookies were melting in the surprisingly warm April sun. I stood with two precocious young boys, brothers Emmanuel and Habakkuk, watching the already cooked dough revert to its pre-baked form. Attention then shifted to the quinoa salad sitting beside the cookies and the platter of sandwiches next to that. The boys’ mother Tyreesha came over, wondering aloud if there were any vegan sandwiches while Emmanuel and Habakkuk elected to race each other down the sidewalk, turning around at a giant pile of bark mulch before racing back to a freshly planted persimmon tree. By then, a crowd had assembled around the table of food. This wasn’t a simple neighborhood picnic: everyone was justifiably hungry, having just spent the morning planting new fruit trees in an orchard called The Fruits of Diversity. 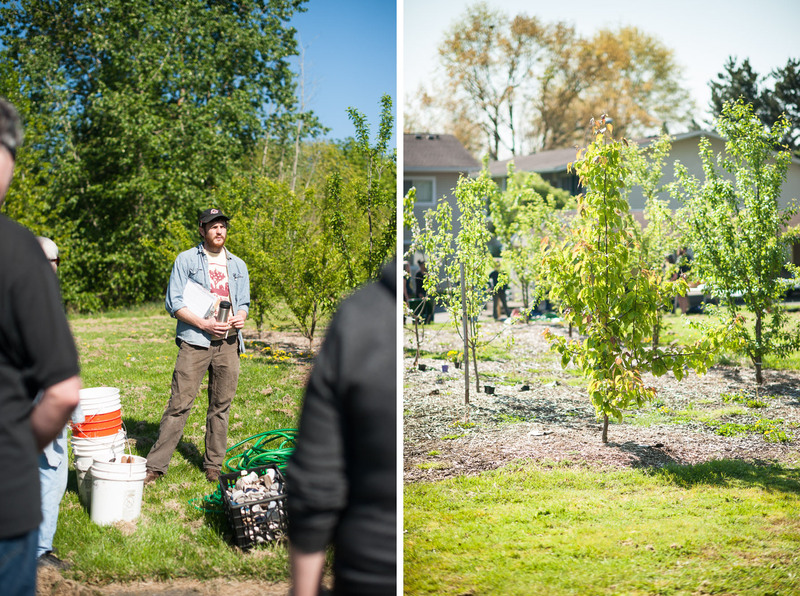 Gareth Stacke, the community orchards coordinator for the Portland Fruit Tree Project, stood in the center of these hungry volunteers and made a wise decision: it was time to eat. 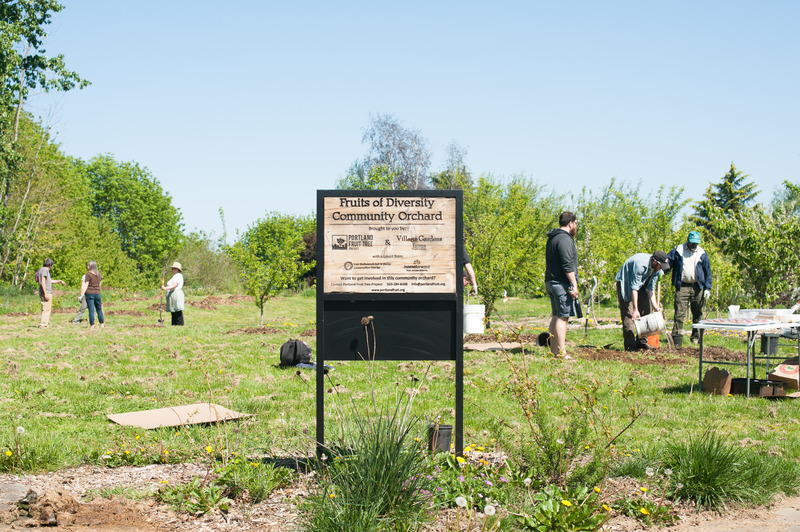 The Fruits of Diversity Community Orchard is located beside the New Columbia and Tamarack housing projects on Portland’s northern border. 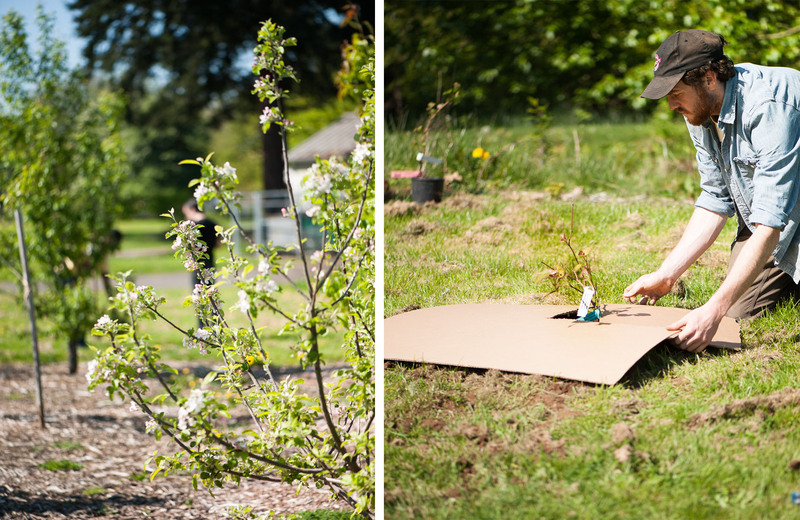 This quarter acre plot of quince, apple, and pear trees isn’t an orchard you might inadvertently drive by or wander into: The Portland Fruit Tree Project revitalized the orchard several years ago, in partnership with Village Gardens. 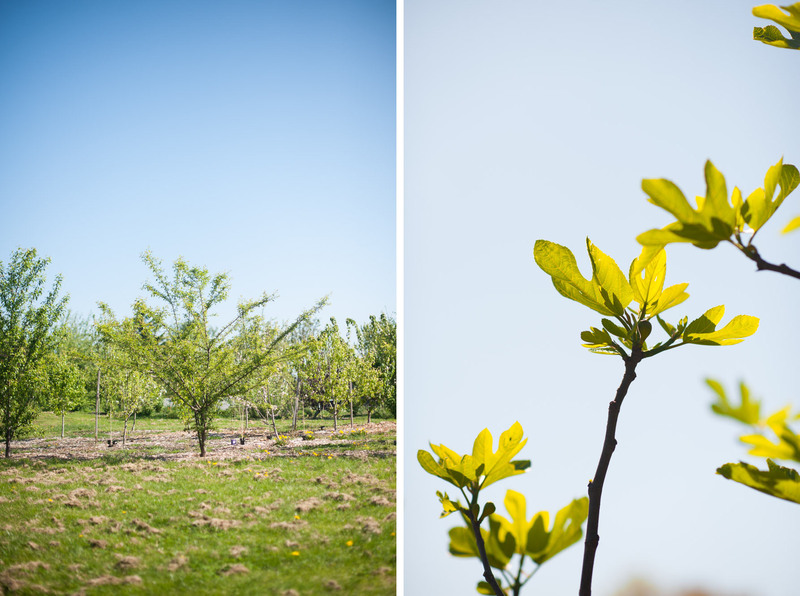 On the April morning I visited, a group of 20 volunteers were adding more trees and fruit vines to the blooming and blossoming orchard, with the ultimate goal of creating a place that neighbors can use as peaceful spot for reflection or for a plucked-from-the-tree snack. 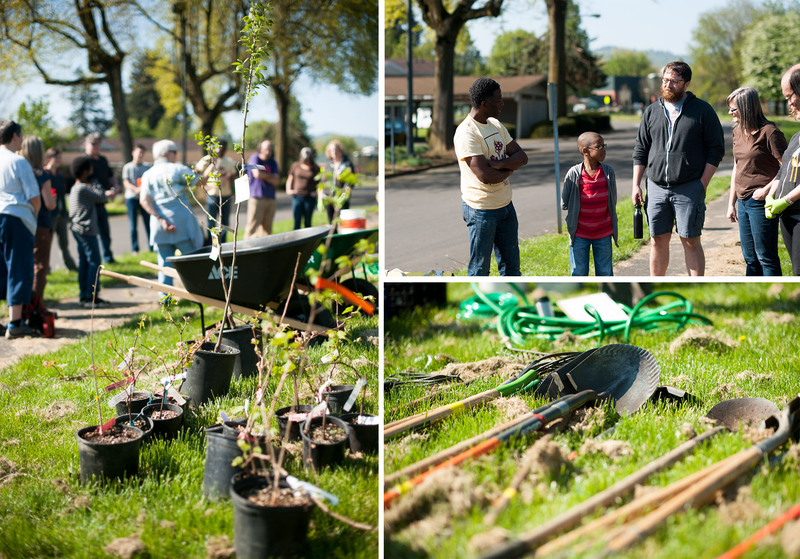 The Portland Fruit Tree Project was created in 2006 as the “Neighborhood Tree Project”. 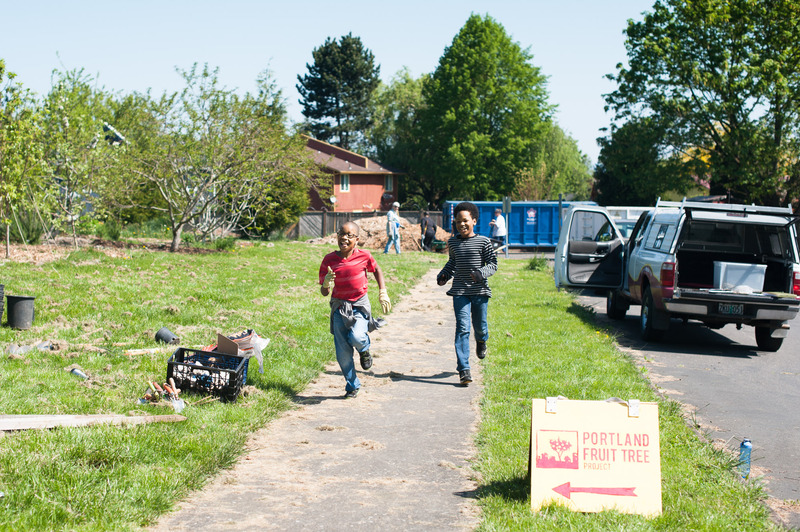 The organization’s original focus is unchanged: to collect the enormous amount of fruit that falls onto sidewalks and into people’s backyards, previously un-captured and rotting, while hungry residents across Portland struggle to access fresh, in-season, and local fruit. Then and now, the collected fruit is distributed to volunteers at harvest work parties, as well as to Portland area food pantries. In 2007, the non-profit changed their name to its current iteration, as awareness of their mission grew and their impact broadened beyond their original neighborhoods. 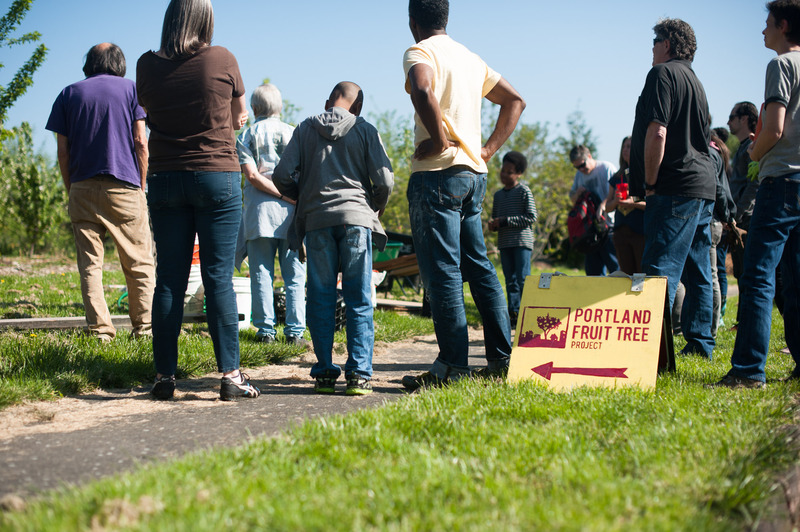 Indeed, in the years since, the organization’s impact is easily measurable; last year, PFTP harvested 50,869 pounds of fruit from trees at 143 sites scattered across Portland. 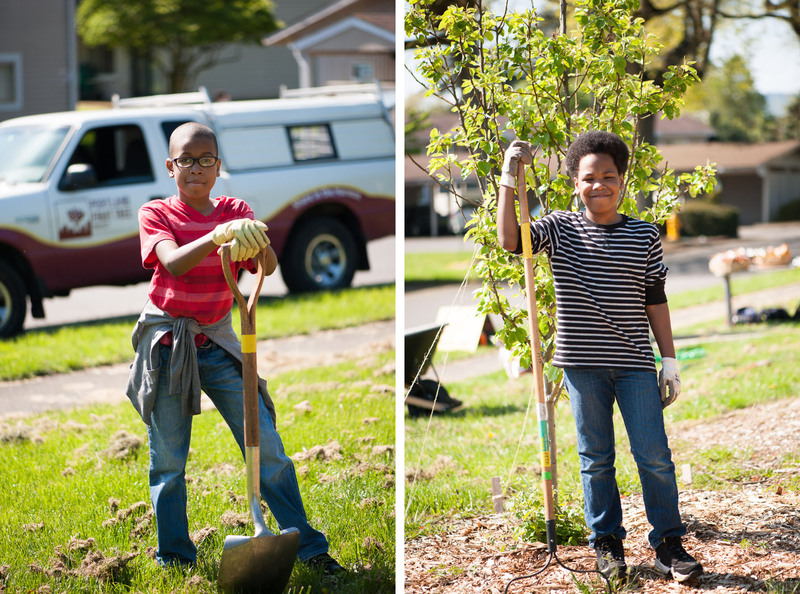 According to Stacke, the organization now has a “well known enough name that we don’t have to look for trees – they come to us.” Today, in addition to harvesting from fruit trees in people’s backyards and in parking strips, PFTP has three other arms of operation: a tree stewardship program, a food education component, and their community orchards, including the one I visited in North Portland. While each program “arm” may feature specific workshops on tree care and food preservation, the events also overlap and cross pollinate with each other, not unlike how the trees in the Fruits of Diversity Community Orchard are unique entities but still complement each other in appearance and in their collective ability to attract pollinators and interested humans. So, a tree planting day like the one I attended also contains information about basic tree care. And this discussion of trees and fruiting seasons naturally dovetails with broader discussions about food education. 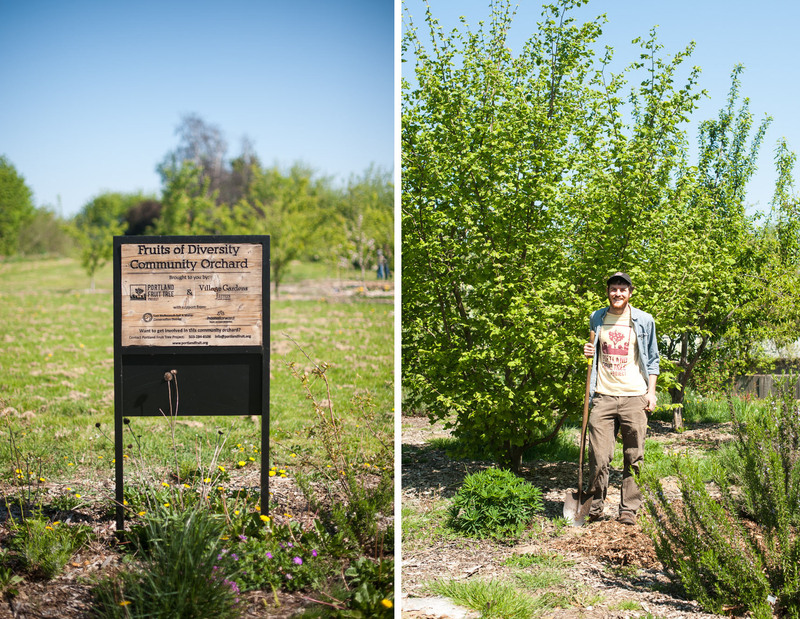 The Fruits of Diversity Community Orchard is an especially unique collection of fruit trees. Stacke told me that it’s the first community orchard in the country on public housing land. While most fruits that PFTP gathers, both from yards and their other orchards, are divided among work parties and food pantries, the goals of this orchard are different. 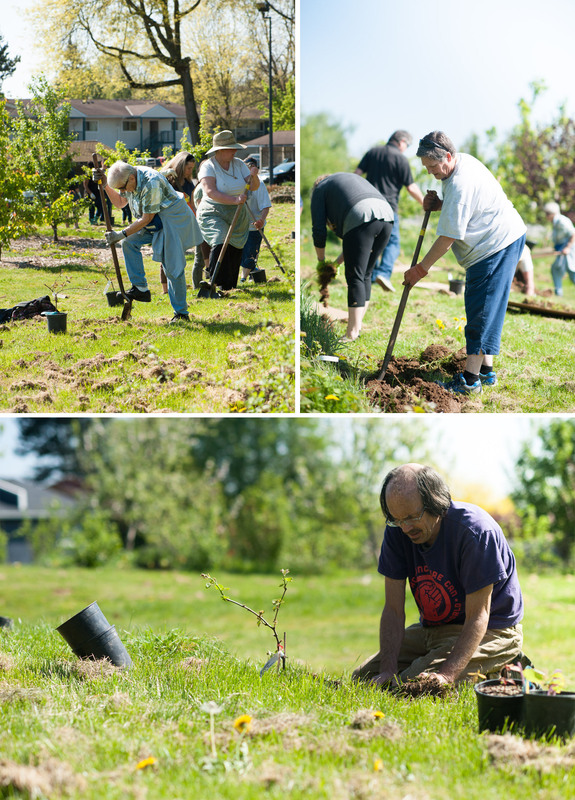 Before digging holes for five fruit trees, eleven grape vines and two kiwi vines, Stacke gathered the volunteers (a mix of community members, fruit tree enthusiasts, and previous volunteers) to introduce himself and talk more specifically about fruit tree care and growth. He ably interfaced with volunteers who wanted to make sure their opinions were heard, as well as integrated others who were new both to the organization and to fruit tree planting in general. It’s this kind of deft hand that will allow PFTP to gradually transition this orchard over to the community that surrounds it, letting the neighbors maintain, prune, and harvest the fruit for each other. When we first met, Stacke spoke with notable excitement about this tangible connection to how fruit grows. “A kid [will be able to] walk through and pick an apple,” he imagined. Before applying to Zenger, Stacke painted himself as a new graduate looking for a way to combine several interests, while keeping an open mind about what that might eventually look like. Until Zenger, his sole farming experience came from a month-long WWOOF program in British Columbia, that he describes as “one of the best months of [my] life”. That amazing month, along with his academic interests in social justice and civil rights, merged together in his mind when he saw the posting for the Zenger internship. “It presented this great cross section of interests in small scale farming, the local food movement, but also with a really integral social justice component,” Stacke elaborated. While WWOOFing, Stacke discovered a love for the day to day life of agriculture, from the physical elements of farming to the variety of tasks each day presented. Most of all, he felt drawn to the intentionality – on a small scale, each action was done for a reason; on a large scale, each action was connected to a bigger picture of ecological and human health. Stacke approaches his current role at PFTP with a similar intentionality: as orchard coordinator, he must navigate different community needs and dynamics, aware of which community organizations to reach out to and support, all while keeping the main mission of PFTP at the forefront – to harvest and preserve fruit. This community aspect seems to be the piece of the agricultural puzzle that resonated the most with him. 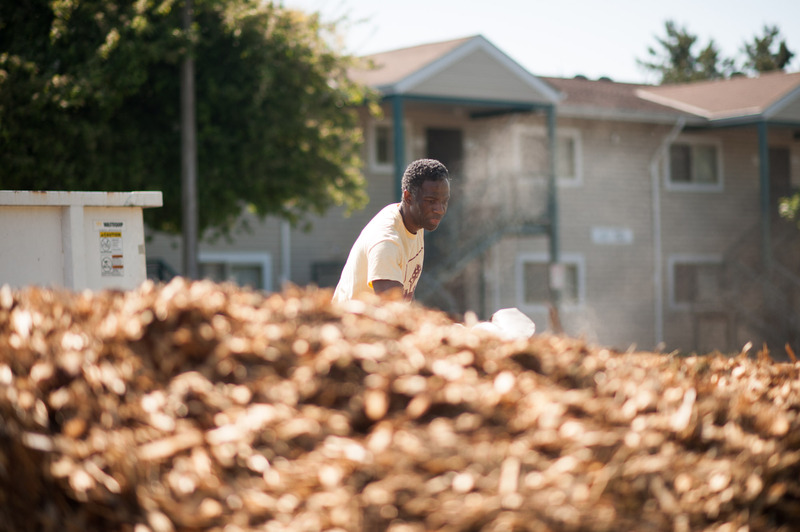 Using food to connect with diverse communities allows Stacke a way to integrate his love of agriculture and his interest in broadening access and expanding conversations. “Farming is the most fun work in the world for me,” Stacke said, but “a lot of time you’re just producing food for people who can pay for a weekly CSA or [fancy] restaurants. But I have a couple problems with that. If you have a bunch of low paid workers making food for people who are paying 30 bucks a plate, there’s a bit of disconnect," Stake astutely noted. 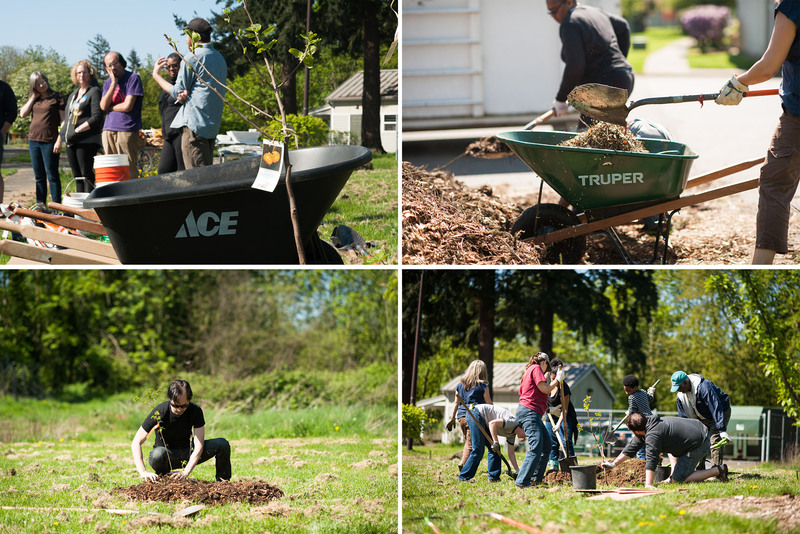 Stacke, along with the Portland Fruit Tree Project, continuously strives to make their impact, appeal, and access as visible as the fruit trees that they harvest. As an Americorps employee, Stacke’s current position ends in July. From there, he may stay with the non-profit, continuing to make these orchards integral parts of the communities in which they grow, or he may move on, a forced uncertainty that’s “an inherent part of being 25,” Stacke noted. But whatever the immediate future, the Zenger Farm internship made longer term plans abundantly clear: Stacke dreams about managing or having his own farm some day. In the meantime, Stacke will apply both intentionality and efficiency to his daily work, as he continues to build connections between the food he loves to harvest and the communities he wishes to serve. Shortly before lunch at Schoolyard Farms' summer camp, Courtney Leeds and Brooke Hieserich decided to shake things up for a few minutes. Standing inside a cool warehouse, surrounded by rack upon rack of oak and steel barrels in various stages of fermentation, Drew Herman was willing to let me taste as much wine as I wanted.